Alcatel launched the Pixi 4 (6) smartphone in India has launched,a slightly upgraded version of the smart phone. 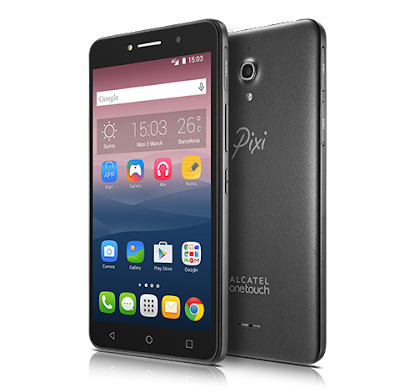 The very first Alcatel Pixi 4 smart phone was launched and showcased at CES 2016 and after that the smart phone was officially launched in June 16. Alcatel OneTouch is an international mobile technology brand which designs, develops, and markets globally a growing range of mobile and internet devices. The company is known for its OneTouch range of Android smartphones. According to the Praveen Valecha, the regional director, Alcatel India said, "Alcatel is committed to bring best technology and user experience at affordable prices to India. Looking at affordability of data packages and availability of video content on demand, we expect growth in 6-inch 4G VoLTE segment. The new PIXI 4 (6) will continue the legacy of improvised Polaroid software, better movie experience and faster browsing . To serve the market better we have recently joined hands with Advanced Computers as our offline distribution partners. The partnership will ensure us to reach more customer base in the market. We will strive to provide better user experience for our customers." He added, "The Pixi 4 is designed for the youth/millennial who want a trendy phone loaded with future proof features and yet not being heavy on the pocket. The Pixi 4 promises the perfect balance of speed, performance and ergonomics. And all of this comes with great features like Arkamys-optimized speakers and Polaroid filters." Featuring 6-inch IPS display, the Alcatel Pixy 4 (6) LTE with HD resolution support(HD 1280 x 720 pixels). A Qualcomm Snapdragon 210 Processor along with 2GB of LPDDR type RAM memory which keeps you ripping through your best of apps. The Pixy 4 (6”) has a powerful 8MP auto-focus rear Camera featuring Polaroid software enhancements; making snap favourite through editing with the display that offers an approximately 72% screen to body ratio. The Pixi 4 Smart phone is an entry level smart phone and available in metallic gold and metallic silver color option in market online and offline in India. The new feature of Alcatel Pixi 4 smart phone has been updated to support the latest 4G LTE connectivity with VoLTE support.It has 8.0 megapixels of HD auto focus primary camera with LED flashlight for low light conditions. It is packed with 2580 mAh Li-ion removable battery that provides more than 10 hours support to the user with the 3g network. It's 1.1 Gha of Processor, supports the user to play high ends games without any trouble or disturbance keep you engage with your social networking to watch a video without straining your eyes. The smart phone has Adreno 304 graphics chip-set for rendering HD Graphics its has chip-set to provide multitasking and Gaming. The new Budget Alcatel Pixi 4(6) smart phone runs on Google’s with the latest Android v6.0 Marsh mellow Operating system with lots the dynamic features like Google Now. The rear camera of the smart phone also supports other camera features like HDR, Timer, Auto focus, Touch focus, Panorama, Auto, and other effects like Mono, Sepia, Negative, etc. The smart phone supports latest 4G V connectivity including 3G/2G and Edge. The Pixi 4(6″) smart phone supports other connectivity features like WiFi 802.11 b/g/n, Bluetooth 4.1 for sharing files, A- GPS, Navigation, FM, and 3.5mm audio output jack. The smart phone also supports other features like Multi Windows Mode. This great value phablet-sized phone is powered by a quad core processor and the Android Marshmallow operating software, so everything is fast and easy to use.For all selfy lovers, the smart phone comes with the HD 5.0 megapixels of fixed focus front facing camera without any flashlight which ease in easy capturing. It's also ideal for framing photos and video you shoot with the 8 megapixel rear-facing auto focus camera.The front facing camera of the smart phone supports HD video recording at 720 pixels resolution. The Pixi 4 (6) smart phone has 16GB of internal storage utility that can be expandable up to 64GB via Micro SD Card slot.The Pixi 4 is just 8.3 mm thick and the sleek uni body feels great in your hand - it looks good too, so no one will believe what a bargain price you got it for! It is a different matter that at this size itself the description of the device is phablet, though there are likely to be smartphones likely to be launched in the near future, by the major companies, with displays as high as 6.4inches. Perhaps the market will call them also phablets, when launched. The precise nomenclature of the device is Alcatel PIXI 4 (6). For the record, the HD IPS display resolution is 720x1280. The size of the phablet is 165x83.8x8.35mm and its weight 186gms. The device follows its predecessors in offering a better overall imaging experience thanks to the Polaroid software and the other features incorporated, including the dual flashes and so on. Users can click photographs and go on and create collages and do editing to add effects etc. The software enables the sharing of these images as well. Those who are familiar with this Polaroid environment may be able to appreciate and make full use of the imaging system on the new Alcatel.The addition of the 4G VoLTE connectivity makes it more attractive in the current scenario in India and probably Alcatel has knowingly added this feature in this device. The Arkamys-optimized speakers on the device, located on the front, enhance the sound delivery for voice calls and audio and video playbacks and streaming. The addition of the 4G VoLTE connectivity makes it more attractive in the current scenario in India and probably Alcatel has knowingly added this feature in this device.Sensors on the smart phone include accelerometer, ambient light sensor, digital compass, and a proximity sensor. The smart phone weighs 186 grams and measures 165x83.8x8.35mm. At these specifications and features, the pricing of the new Alcatel PIXI 4 (6) is not too expensive at Rs 9, 100.